Sopwith Camel F.1 - Single-seat fighter aircraft. The main production version. Armed with twin synchronised Vickers guns. Sopwith Camel 2F.1 - Shipboard fighter aircraft with a slightly shorter wingspan. One Vickers gun replaced by an over-wing Lewis gun. Bentley BR1 as standard engine. Sopwith Camel "Comic" Night fighter - The twin Vickers guns were replaced with two Lewis guns on Foster mountings firing forward over the upper wing, since the muzzle flash of the Vickers guns tended to blind the pilot. To allow the pilot to reload the guns, the pilot seat was moved about 12 inches (30 cm) to the rear. To compensate for this, the fuel tank was moved forward to maintain the correct centre of gravity. Served with Home Defence Squadrons against German air raids. The "Comic" nickname was unofficial and was shared with the night fighter version of the Sopwith 1½ Strutter. Sopwith F.1/1 - Version with tapered wings. 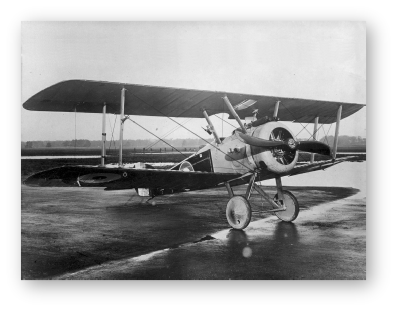 Sopwith T.F.1 (Trench Fighter) – Experimental aircraft not brought into service. Designed to attack trenches, hence “Trench Fighter”. It had downward angled machine guns for efficient strafing and armour plating for protection against gunfire from below. The Camel was first flown by Harry Hawker at Brooklands on 22 December 1916. It was powered by a 110 hp Clerget 9Z rotary engine. The Sopwith Camel was a British First World War single-seat biplane fighter introduced on the Western Front in 1917. Designed as a replacement for the Sopwith Pup, it had a short-coupled fuselage, a heavy, powerful rotary engine, and concentrated fire from twin synchronised machine guns. Despite being a formidable warplane in the hands of an experienced pilot, the Sopwith Camel was difficult to fly and many novice pilots came to grief at its controls. It quickly gained an unfortunate reputation with student pilots. It had unmatched manoeuvrability and was credited with shooting down 1,294 enemy aircraft, more than any other Allied fighter of the war. It also served as a ground-attack aircraft, especially near the end of the conflict, when it was outclassed in the air-to-air role by newer fighters. On the ground it was nose heavy because engine, pilot, guns and fuel tank (approximately 90% of the weight of the aircraft) were within the front seven feet of the aircraft which was 18 ft 9 in long in total. Many crashed due to mishandling on take-off when a full fuel tank affected the centre of gravity. In level flight, the lift from the wings changed the weight distribution making it tail-heavy. Unlike the Sopwith Triplane, the Camel lacked a variable incidence tailplane, so that the pilot had to apply constant forward pressure on the control stick to maintain level flight at low altitude. The aircraft could be rigged so that at higher altitudes it was able to be flown "hands off." The strong gyroscopic effect of the rotary engine gave it a strong pull to the right which needed constant rudder control to maintain straight flight. With rotary engines, the crankshaft remains static and the cylinders, crankcase and attached propeller rotate around it. The torque of this rotating mass produces a significant "pull" to the right. In the hands of an experienced pilot, this characteristic could be exploited to give exceptional manoeuvrability in a dogfight. A 3/4 turn to the right could be done in the same time as a 1/4 turn to the left. A stall immediately resulted in a particularly dangerous spin which was difficult to correct and claimed the lives of several inexperienced pilots. The Clerget engine was particularly sensitive to fuel mixture control and incorrect settings often caused the engine to choke and cut out during take-off. The fuel mixture had to be weakened immediately after take-off to avoid this problem. The Sopwith camel had a number of engine variants. The Gnome "mono" engines did not have throttles and were at full "throttle" while the ignition was on. They could be "throttled back" with a selector switch which cut the ignition to some of the cylinders to reduce power for landing. The Clerget, Le Rhone and BR1 engines had throttles, although reducing power involved throttling back and simultaneously adjusting the mixture. This was not straightforward, so it became common during landing to "blip" the engine (turn the ignition off and on) using a control column-mounted ignition switch, the blip switch, to reduce power. Camels were powered by several rotary engines.